Five weeks into the new Gallagher Premiership season and Worcester Director of Rugby Alan Solomons believes it's already a two-horse race between Saracens and Exeter Chiefs for English rugby's top prize. 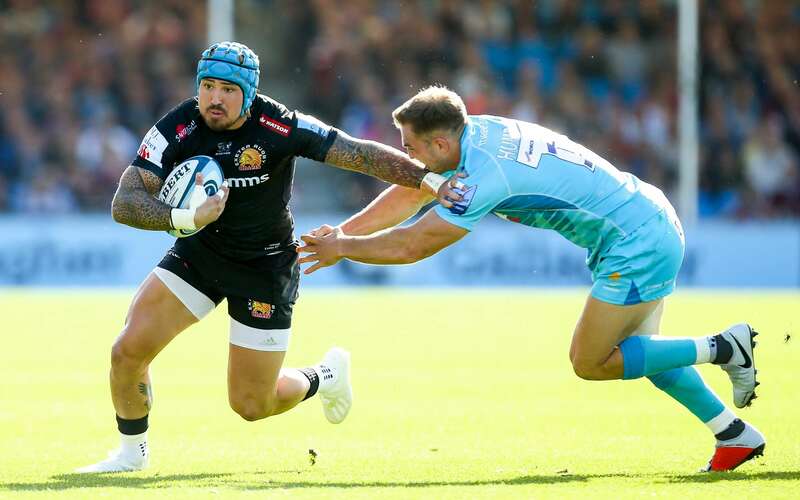 The South African's assessment came in the wake of his side being downed in Devon as the Chiefs maintained their unbeaten start to the new season with a 28-11 success at Sandy Park. Rob Baxter's outfit bagged their fourth maximum haul of the campaign, but in truth they were never at their ruthless best and their esteemed leader admitted as much at the final whistle. "We were sloppy at times today, especially in the second half," said Baxter. However, an average day at the races for the Chiefs is more than a decent return for many of their rival runners and riders within the Premiership. On a perfect afternoon for rugby, the home side had too much power and pace for the Warriors, who were hoping to back up last weekend's impressive win at Leicester with another notable scalp in the Westcountry. 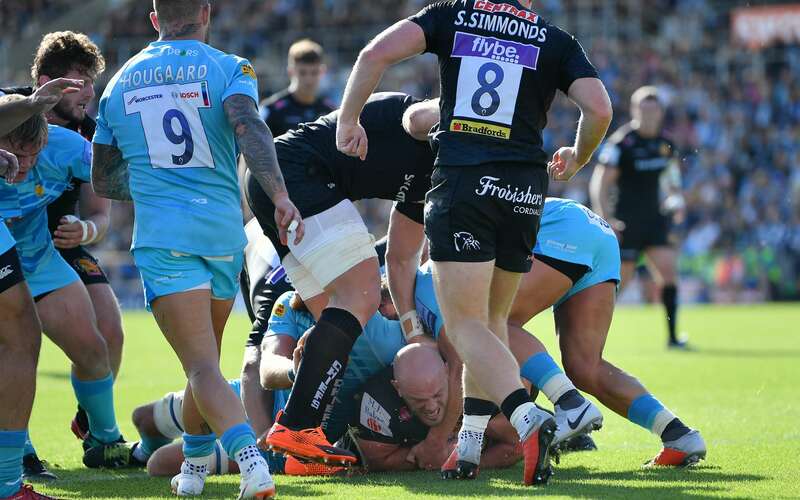 Exeter's powerful pack again did much of the major damage, creating tries for skipper Jack Yeandle, Harry Williams and a brace for Dave Ewers on his first league start of the season. Fly-half Gareth Steenson converted all four scores to take him to 2,000 league points in Chiefs colours. In reply, the Warriors countered with a try from rising star Ted Hill and two penalties from Chris Pennell, but that was all they could muster as the Chiefs gained revenge on the Midlanders, who last season were the only visiting side to win at Sandy Park in the Premiership. Ahead of kick-off, Baxter again tinkered with his winning formula from that which had ground out a hard-fought victory on the road at Newcastle. Up front, Yeandle was joined in a new-look front-row by Alec Hepburn and Tomas Francis, while behind them Dave Dennis and Ewers offered some signficant bulk to the Exeter engineroom. Steenson was recalled as Chief playmaker, Ollie Devoto came into the midfield, while the inclusion of Jack Nowell on the wing meant the home side were forced to re-jig their back three. The Cornishman was one of two British Lions on the flank, the other being Alec Cuthbert, while Argentinian flyer Santiago Cordero slotted in at full-back. With two Lions and a Puma lurking in the back field, it was a predatory attack that the home side were looking to unleash on the Warriors, who themselves had made six changes to their starting line-up from that which took to the field at Welford Road the previous week. The opening exchanges were somewhat frantic as the two teams looked to gain the early ascendancy. Both huffed and puffed in terms of attacking ideas, but with defences on top there was very little for anyone to write home about. The deadlock, though, was finally broken on 18 minutes when Pennell slotted the visitors in front with a penalty. The experinced full-back landing a lengthy kick after Ian Whitten had been harshly penalised for not rolling away at the tackle area. Worcester's lead would prove short-lived as the Chiefs finally started to click into gear. Straight line running was the order of the day for the 'Men in Black' who slowly, but surely, battered their way into enemy territory. A line-out midway inside the Worcester half wasn't the best of attacking platforms from which to work, but when Anton Bresler deliberately slapped the ball down, it gifted the Chiefs the chance to send the ball to within yards of the Warriors line. The visitors - like so many - know what the Chiefs are planning just five metres out, but halting the Exeter juggernaut in full flow is no easy matter. Yeandle threw in the resultant line-out and the club captain was on the end of the impressive drive that had Worcester splintering out in every conceivable directions. Try scored, try converted by Steenson. Up and running, the Chiefs would threaten again just moments later as first Devoto looked to finish off from a Jack Maunder snipe, then Cuthbert's rangy run through the middle saw him held up on the line by some desperate defence. The pressure was mounting by the minute and when the next tsunami of Exeter attacking waves flooded in, there was to be no resistance as Ewers powered his way over from close range. Steenson added the extras to that score and his side's third which arrived on the stroke of half-time, again through the brute force of Ewers, who again applied the finish from five metres out following sustained home pressure. It was a strong ending to the first half for Baxter's side, but on the resumption they were again slow to start as the Warriors set about trying to haul in their rivals. Minus England international Sam Simmonds - who was forced off during the interval - the Chiefs were on the back foot from the outset. Worcester were pushing hard in attack and when Hepburn was penalised at scrum time just four minutes into the half, it allowed Pennell the simplest of tasks to slot a penalty from in front of the home posts. Moments later and the visitors were again on the front foot, this time through Beck and Pennell who made decent inroads into the home 22. Looking to make the most of fast ball, South African international Francois Hougaard sniped for the line, only to be held up just short. However, as the visitors recycled possession, working their way through a series of raids, it eventually fell to Hill, who was able to plough his way over for their opening try. Pennell's conversion looked odds-on for the target, only to cannon back off the post to leave just ten points between the two sides. Now with the bit between their teeth, Worcester looked to cut the deficit further. The Chiefs, though, were having none of it as they put up a stubborn defensive rearguard action to keep them at bay. At one stage, the home side were forced into a three-minute spell of defending, the fruits of which not only only kept the scoreboard untouched, but also saw them win a penalty when Perry Humphreys needlessly dropped a knee on Cordero as he looked to tidy up possession behind his own posts. The threat averted, it was now the turn of the Chiefs to flex their attacking muscles. Replacement Sam Hill linked well with Jack Maunder, only for the latter to knock-on at the key moment, then Cuthbert also went close with another charging run down the left wing. Nowell was next to go close, he was held up on the line, creating a scrum just five metres out. Scrum one went down, as did number two, so when it happened for a third time under pressure, referee Ian Tempest had no option but to warn the visitors that further sanction would follow it happened again. Exeter, knowing they had the upper hand in the set-piece, went once more. Again, the Worcester eight crumbled and off went prop Ryan Bower for a ten-minute stint on the sidelines. With the man advantage, the Chiefs made sure of the all-important bonus point when England international Williams burrowed his way over by the posts just minutes later. Steenson again obliged with the additional two points. With a healthy buffer at their disposal, the Chiefs happily closed out the contest, safe in the knowledge that they can - and will - play better than this in the future. For now, points secured, the focus now switches to Friday's trip to the Roman City where Bath lie in wait. Chiefs: S Cordero; J Nowell, I Whitten, O Devoto (S Hill 53), A Cuthbert (J Simmonds 55); G Steenson, J Maunder (S Townsend 74); A Hepburn (B Moon 53), J Yeandle (capt, E Taione 74), T Francis (H Williams 53); D Dennis (O Atkins 55), J Hill; D Ewers, M Kvesic, S Simmonds (S Lonsdale h/t). Warriors: C Pennell; P Humphreys, A Beck (O Lawrence 60), R Mills, J Adams (M Heaney 29); J Lance, F Hougaard; C Black (R Bower h/t), J Singleton (J Taufete’e 60), G Milasinovich (S Kerrod h/t); A Bresler (A Kitchener 60), D Barry; T Hill, M Mama, GJ Van Velze (capt, M Cox 56, C Black 69). Replacement (not used): D Weir.